Elvin Ernest Hayes (born November 17, 1945) is an American retired professional basketball player and radio analyst for his alma-mater Houston Cougars. He is a member of the NBA's 50th Anniversary All-Time Team, and an inductee in the Naismith Memorial Basketball Hall of Fame. A quiet, introverted youth, Hayes first picked up a basketball in eighth grade, by accident. He was wrongly blamed for playing a classroom prank and was sent to the principal's office. But another teacher, Reverend Calvin, saw Hayes and said he was welcome in his class. Although the youngster showed no inclination for any sports, Calvin thought he would benefit by playing basketball and put him on the school team. Hayes was so clumsy, however, that he evoked laughter with his awkward attempts at shooting and dribbling. But young Hayes was determined to improve, and during the summers he practiced long hours. As a 6'5" ninth grader he was a benchwarmer on the junior varsity squad at Britton High School when he became determined to crack the starting lineup. "I was too weak to shoot the turnaround then", Hayes recalled, "so all summer long I shot with a small rubber ball at a basket in my yard. My development was almost overnight." In Hayes's senior year, 1963–64, he led Britton to the state championship, averaging 35 points during the regular season. In the championship game he picked up 45 points and 20 rebounds. 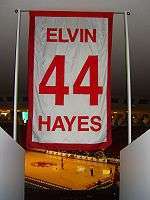 One of only five numbers retired by the University of Houston men's basketball team, Hayes's #44 hangs in Hofheinz Pavilion. Hayes and Don Chaney were the University of Houston's first Black American basketball players in 1966. In 1966, Hayes led the Cougars into the Western Regional semi-finals of the 1966 NCAA Men's Division I Basketball Tournament before losing to the Pac-8 champion Oregon State Beavers. In 1967, he led the Cougars to the Final Four of the 1967 NCAA Men's Division I Basketball Tournament. He would attempt 31 field goals, and score 25 points and 24 rebounds in a semi-final loss to the eventual champion UCLA Bruins featuring Lew Alcindor (now known as Kareem Abdul-Jabbar). His rebounding total is second to Bill Russell's Final Four record of 27. On January 20, 1968, the Big E and the Houston Cougars faced Lew and the UCLA Bruins in the first-ever nationally televised regular season college basketball game. In front of a record 52,693 fans at the Houston Astrodome, Hayes scored 39 points and had 15 rebounds while limiting Alcindor to just 15 points as Houston beat UCLA 71–69 to snap the Bruins' 47-game winning streak in what has been called the "Game of the Century". That game helped Hayes earn The Sporting News College Basketball Player of the Year. One month later, he grabbed a career-high 37 rebounds in a game against Centenary on February 10. In the rematch to the "Game of the Century", Hayes faced Alcindor and UCLA in the 1968 NCAA Men's Division I Basketball Tournament at the Los Angeles Memorial Sports Arena. He was held to 10 points, losing to Alcindor and the Bruins 101-69 in the semi-final game. Hayes led Houston in scoring (1966 27.2 points per game, 1967 28.4, and 1968 36.8). For his college career, Hayes averaged 31.0 points per game and 17.2 rebounds per game.He has the most rebounds in NCAA tournament history at 222. With his departure from college Hayes was selected as the first overall selection in the 1968 NBA draft by the San Diego Rockets and by the Houston Mavericks in the 1968 ABA draft. While a student at Houston, Hayes was initiated into the Alpha Nu Omega Chapter of the Iota Phi Theta Fraternity. Hayes joined the NBA with the San Diego Rockets in 1968 and in his rookie year, he scored a career-high 54 points against the Detroit Pistons on November 11 of that year. As a rookie, Hayes led the NBA in scoring with 28.4 points per game, averaged 17.1 rebounds per game, and was named to the NBA All-Rookie Team. Hayes' scoring average is the fifth best all-time for a rookie, and he remains the last rookie to lead the NBA in scoring average. In Hayes' second season, he led the NBA in rebounding, becoming the first player other than Bill Russell or Wilt Chamberlain to lead the category since 1957 (Chamberlain was injured during much of the season). In Hayes' third season, 1970–71, he scored a career best 28.7 points per game. In 1971, the Rockets moved to Houston, enabling Hayes to play in the city of his college triumphs. Hayes was acquired by the Baltimore Bullets from the Rockets for Jack Marin on June 23, 1972. He teamed with Hall-Of-Famer Wes Unseld to form a fierce and dominating frontcourt combination. The 18.1 rebounds per game Hayes averaged in 1974 is the third highest rebounding average of any NBA player since Wilt Chamberlain retired in 1973. Hayes and Unseld later led the Washington Bullets to three NBA Finals (1975, 1978 and 1979), and an NBA title over the Seattle SuperSonics in 1978. During the Bullets' championship season (1978), he averaged 21.8 points and 12.1 rebounds per game in 21 playoff games. Hayes set an NBA Finals record for most offensive rebounds in a game (11), in a May 27, 1979 game against the SuperSonics. The Chicago Bulls' Dennis Rodman would tie this record twice, both games coming in the 1996 NBA Finals, also against the SuperSonics. Desiring to finish his playing career in Texas and preferably Houston, Hayes was sent back to the Rockets for second-round draft picks in 1981 (Charles Davis) and 1983 (Sidney Lowe) on June 8, 1981. The "Big E" closed out his career with the Rockets in 1984. Hayes had a career scoring average of 21.0 points and 12.5 rebounds per game. He played at least 80 games in every season. He ranks fourth in NBA history in total rebounds, behind Chamberlain, Russell and Kareem Abdul-Jabbar. Shortly after finishing his career in the NBA, Hayes returned to the University of Houston to finish the last thirty credit hours of his undergraduate degree. When interviewed about the experience, Hayes mentioned, "I played 16 years of pro basketball, but this is the hardest thing I've ever done." For a while he owned a car dealership in Crosby, Texas. In November 2007, Hayes became a City of Liberty Police Reserve Officer, fulfilling a childhood dream. On November 22, 2010, it was announced that he would serve as an analyst for radio broadcasts of Houston Cougars games on Houston's KBME. Hayes is currently a reserve police officer with the City of Jersey Village, a suburb of Houston. In his career with the San Diego/Houston Rockets and the Baltimore/Capital/Washington Bullets, Hayes played 1,303 games over 16 seasons, registering 27,313 points (ninth all-time) and 16,279 rebounds (fourth all-time). 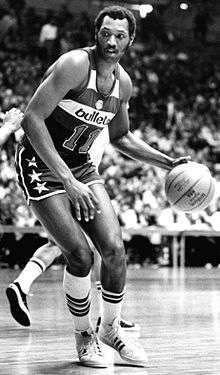 He is the all-time leading scorer for the Washington Bullets/Wizards. Hayes never missed more than two games in any of his 16 seasons in the NBA. In addition to his 1968 scoring title, he led the NBA in rebounding in 1970 and 1974. Hayes played in twelve straight NBA All-Star Games from 1969 to 1980. Hayes was named to the NBA's 50th Anniversary All-Time Team during the 1996–97 NBA season and was elected to the Naismith Memorial Basketball Hall of Fame in 1990. He boycotted the Hall of Fame beginning in 1990 and refused to return until Guy Lewis, his coach at the University of Houston, was admitted. Lewis was admitted to the Hall of Fame in 2013, and Hayes was there for the first time since his induction in 1990. In 2003, Hayes was also inducted by the San Diego Hall of Champions into the Breitbard Hall of Fame honoring San Diego's finest athletes both on and off the playing surface. ↑ 1981 NBA Draft Pick Transactions – Pro Sports Transactions. ↑ Callahan, Tom (1985-12-23). "Impressions in Black and White". Time Magazine. Retrieved 2009-02-22. ↑ "Elvin Hayes to Join Men's Basketball Radio Broadcast Crew". Houston Cougars athletics. 2010-11-22. Retrieved 2010-11-23.